Motorcycle crashes are among the most dangerous accidents on the roadways. Motorcycle accidents commonly result in catastrophic injuries or fatalities because the motorcycle drivers and passengers have little protection and typically collide with much larger vehicles. Most motorcycle accidents are usually caused by the negligence of a motor vehicle. In fact, there are studies that maintain that over 80% of multi-vehicle accidents involving motorcycles are caused by the negligence of the driver of an automobile. 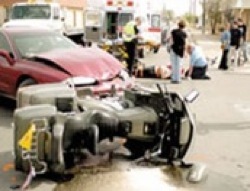 Often, this occurs because motorcycles can stop much faster than cars and are thus more likely be rear-ended by a negligent driver following too closely. Many motorcycle accidents also occur when the driver of an automobile fails to yield the right of way. Regrettably, motorcycle accident victims are 21 times more likely to die than personal injury victims in a passenger car or truck.